I was so inspired to read this note knowing that not only is Lucianne guiding the children, but their mothers as well. And yes, she really is just like Mary Poppins. The Y Employees Who Play Together…Get Wet and Dirty and Act Like Kids Together!! As the theme played loudly and the torch was relayed to groups around the track, the excitement and anticipation in the air was palpable. The athletes, many with their bodies painted like warriors, others enthusiastically waving enormous handmade flags corresponding to their representative countries, waited with hunger and intensity clearly visible in their eyes. Muscles tensed under flag-bedecked shirts; nostrils flared beneath the warpaint that had been so painstakingly applied by fellow team members. While mere moments before, the competitors had been genially greeting one another, right now, in this moment, the gravity of what was at stake was evident and showed acutely in their stance and demeanor. 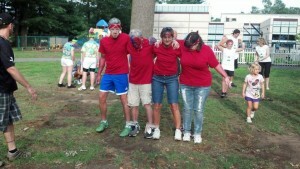 The first official Wheeler YMCA Staff Olympics were about to begin. Sunday saw over 50 staff members not only immensey enjoying each other’s company, but having the opportunity to actually play together. Our Tri Club coordinator and longtime Wheeler Y advocate, Stacia ‘Crazy Train’ Cardillo, had decided it was high time the staff here had a chance to participate in something physical, fun, and fantastic. Along with her always supportive husband Todd and their three children, Stacia organized and coordinated the event which brought departments together and provided an amazing evening for us to all enjoy. Stacia recruited members of the Tri Club to volunteer during events, set up the potluck dinner participants had brought, and clean up the grounds and facility afterward. This alone meant a great deal to me – that none of us had to worry about anything but having fun was a wonderful treat. While there had been much speculation and some ‘friendly banter’ (read: ‘smack talking’) in the week leading up to the event, nothing could have prepared us for the events that awaited us. Thinking those golf balls are an ace in the hole for the team which contains the best golfer in town? No such luck – they actually had letters printed on them, and one lucky teammate got to bob for them in a pool of water and return them to the remainder of the team for word-making. Those old, small-wheeled tricycles? Even the toughest of our Personal Trainers struggled and called ‘Uncle’ halfway through the race. Communication was key in the five-legged race, and it was clearly and painfully obvious which of us had never, ever used a slip-and-slide before. The end of six events saw the previously tough, lean, and mean combatants reduced to soaked, sudsy, muddy, grass stained, bruised, and battered remnants of themselves. Review of some photos allegedly contain a tear or two. Regardless of points earned, places obtained, or ribs aching, each of us had one thing in common: through the dirt and the paint and the grimaces (and the looks of pure incredulity that we simply could not pop those balloons!! ), we all wore a dazzling smile. In the picture is some of our West Hartford YMCA campers and counselors with one of many filled bins of recycled items the camp had collected. 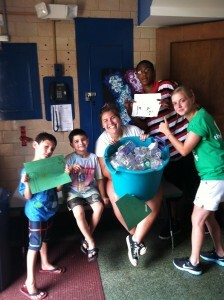 During our “GO GREEN” theme week at camp, the campers learned to reduce, reuse and recycle items. The groups at camp got the chance to try a various number of games and make crafts with different recycled materials. The campers gained knowledge on how to recycle different types of objects and how to keep our earth clean! About a month ago our Y got a call from a group of moms wanting to purchase a week of camp and donate it to a child in need in honor of their children’s school teacher. Pam our office manager worked with one of the moms and explained that she had the perfect family that could benefit from this. During the conversation Pam gave a little background about the family and little boy. They completed the transaction and went on their way. An hour later Pam got a call from the same mom she had helped earlier and the mom was so touched by Pam’s story that she wanted to personally purchase another week for the little boy. Well, Miguel has completed his first week at camp and we are so anxious to share with our classroom moms and special donor how she has made such a difference in his summer. Remember stories are powerful and help our communities be better places. WG Wellness takes over Summer Camp! This week the Wilson-Gray Wellness Staff made a trip to the Farmington High School summer camp to help raise health awareness. The Wellness Staff introduced the campers to an activity that incorporated Exercise, Art and a Writing component. The exercises included heel touches, jumping jacks, squats, high knees and toe taps. The art and writing component was combined into the creation of an affirmation statement punctuated with gestures or movements depicting each phrase of the affirmation statement. The campers were then given the opportunity to create their own affirmation statement amongst themselves and present them amongst their fellow campers. It takes 17 muscles to smile! From 11:45 am through 1:00 pm our Welcome desk is jamming with check-ins, towel service, tours, phone calls, cycle tickets, and the roar of friends meeting for their daily lunch workout. It gets loud, busy, and sometimes overwhelming for the one person who “man’s the desk,” but he does it with grace and humor. Kirk is a real gem here at Downtown! This past week I was able to offer a session of residence camp to a child who who receives financial aid from the YMCA. This child will be able to attend residence camp because of the funds made available from our Kids to Camp golf tournament. This mother was so excited that this opportuinty was made available to her son. She mentioned that she had gone to Camp Jewell as a child and how she only wished her children could have the same experience. She was so grateful and so excited for her son. I will be the chair of this tournament next year and I only hope to be able to raise even more money so we can send even more kids to camp. It is such a great feeling to be able to give something like this away to a deserving child. It may just change his life. On Monday, a woman knocked on my door. She introduced herself and paused for a moment. She then took a step closer to me and without making eye contact she quitely said, “I am going to try to say this without crying.” With a million scenarios running through my head, I asked her to take a seat at a table and I patiently waited for her to continue. After a few moments, she looked up at me and said, “I want to learn how to swim and I want YOU to teach me.” With tears pooling in her eyes she blinked and then continued. “I am 65 years old and have missed out on so many things in my lifetime because I don’t know how to swim. I am very much afraid but I want to learn.” As I sat listening to her, I fought back my own tears, not wanting to make her cry but managed to tell her how honored I was that she specifically asked me to help her through this journey in her life. This incredibly brave woman has presented the opportunity for me to change her life and rid her of this admittedly crippling fear that she has. She trusts me already which is unbelievable. I begin working with her on Friday and can’t help but feel that this will not only be life changing for her but for me as well. As the summer swings into full gear so does our programming for youth, teens and families. The summer brings warm temperatures, sunny days, cookouts, swimming and water play, camp songs, fire flies, fun-filled festivities, and more. Summer in New England is unbeatable. We are happy to report that our annual golf tournament yielded almost $62,000, which will enable us to send more children to camp than in recent years. At camp, deserving children will be guaranteed an opportunity to run care-free in the woods; play or swim (or learn to swim) in our pools or ponds; tell stories (or tales) by a camp fire; see the stars in the glistening sky; build new and lifelong relationships; discover a thing or two about themselves; connect with a caring adult or near-adult (counselor); be one with nature in all of its grandeur; and simply be a kid – having fun and learning, as new adventures permit us to learn. We are blessed to be able to provide our children with summer camp experiences. We thank the many individuals who support this critical aspect of our work. We send special thanks to Jen Daly and our Golf Committee for their hours of dedicated work; it resulted in an incredible “return on mission.” Thanks also to the tremendous leadership provided by our “second to none” camping staff; we are “deeply moved” by your commitment to the service of others – our children. If you want to see our mission/vision in action, visit a Y camp this summer; it will do your heart good! Today while speaking to someone they recounted a recent interaction between her sister and her 6 year old nephew. Enough said…What a statement for Camp Jewell and the Y!